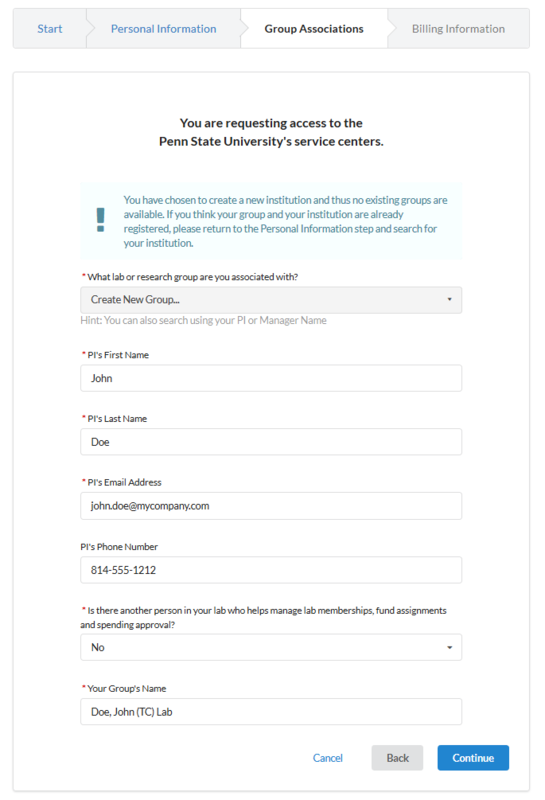 As a non-Penn State user, you will need to establish an iLab account, associating yourself with your institution. 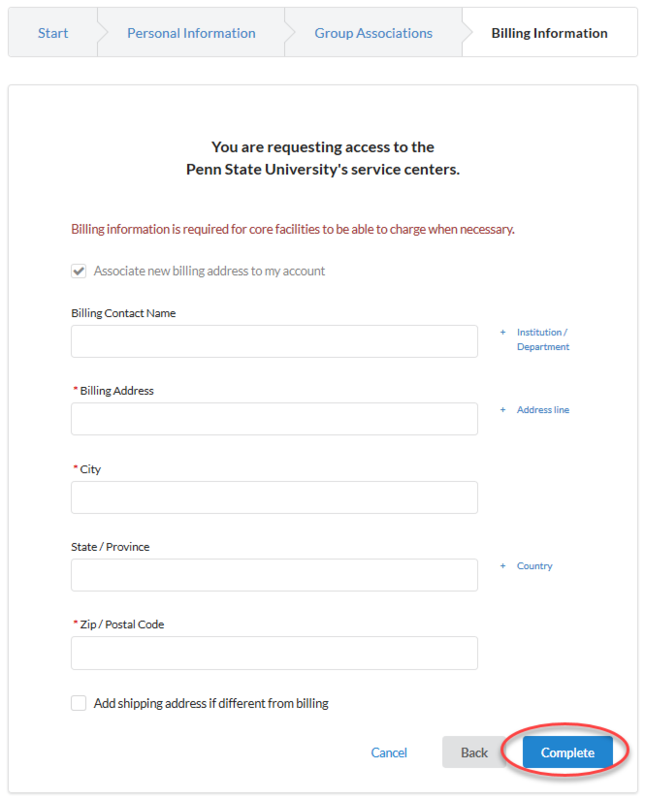 Please use your institution contact information even if you have been granted a Penn State Web Access account. External users must complete an Academic Research Services Order (ARSO) to access University services. Please see the facility for instructions on obtaining an ARSO. n a browser, navigate to the Penn State iLab website. **Please bookmark this site for future reference. ** Click the login button in the upper right corner of the page. Complete the form by entering your email address, checking the “I’m not a robot” checkbox. Check the “I agree with iLab’s privacy and security policies” checkbox. Complete the following the Personal Information form. Select your institution from the drop down list. 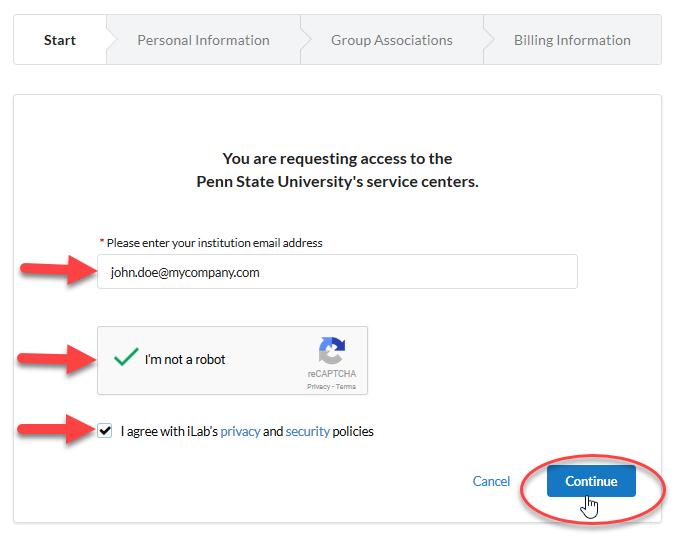 If your institution or company is not listed, please type in the name of your institution or company in the field in order to register it in iLab. Select your role from the drop down list. If your role is not listed, you may choose Other and enter your role title. Select the Continue button to proceed with the registration. Complete the following the Group Associations form. If you chose to create your institution on the previous page, you will see a green box at the top of this form alerting you that you have made that choice. Fill in your PI’s Last Name. On the final registration tab, please complete the Billing Information for the billing contact in your organization. 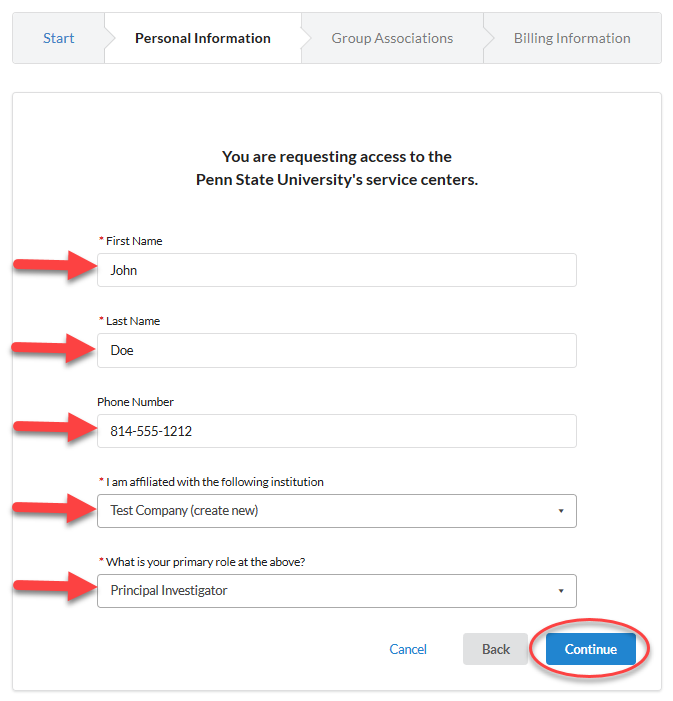 Check the “Associate new billing address to my account” to associate this billing address with your iLab account. If you are working with cores which will be shipping items to you and your shipping address is different than the billing address, check the Add shipping address if different from billing checkbox and enter your shipping address. Click the Continue button to finalize your registration.